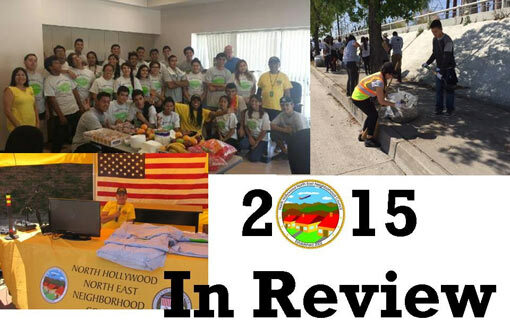 2015 was a very productive year for the North Hollywood North East Neighborhood Council (NHNENC). We were recognized by City Hall for the work we did in collaboration with Councilmember Krekorian’s office and NoHo West Neighborhood Council to create the Vintage North Hollywood Mural on Whitsett and plant the surrounding slopes with drought tolerant plants. In conjunction with the recognition ceremony we were given a special tour of City Hall and met the LAX PUP team. We were also honored for this project by the Valley Alliance of Neighborhood Councils. Conducted outreach at the St. Baldrick’s Day event at Fire Station 89 March. Supported the Spring Egg Hunt at the Valley Plaza Recreation Center April and were on hand to meet members of the community. Supported Summer Movies Series of six movies with Councilmember Krekorian, and other Neighborhood Councils. Earth Day: Worked with Councilmember Krekorian’s Office to put on an Earth Day clean up in April. We cleaned up Sherman Way and Laurel Canyon tackling some of the worst public streets in our Council area. The streets and sidewalks near this intersection have long been a difficult area to keep tidy, and the Council has devoted a few cleanup efforts to improving them. National Night Out Clean Up and BBQ at the City Department of Transportation: Cleaned up the Whitsett Slope. Partnered with Councilmember Krekorian, NoHoWest NC, and Neighborhood Watch. Neighbors met each other, our Board Members and other elected officials while enjoying dinner after the clean up. Hart Street Community Clean Up: Partnered with Councilmember Krekorian in August to clean up Hart street from Laurel Canyon to Lankershim. We take great pride in keeping the community informed on our goings on and community news. 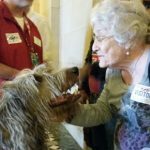 We keep our website updated with events and news items and our meetings focus on topics of interest to the community: Veteran’s Issues, Raise the Wage, and the LA Family Housing Density Plan. We consider land use issues such as a new Costco Business Center on Sherman Way and alcohol licenses. We have also had guest speakers such as the newest Commissioner of the Board of Public Works: Joel Jacinto and we held a Town Hall on Paid Sick Days. One on the most fun events we supported was funding a field trip to Underwood Family Farms for 135 kindergarteners at Strathern Elementary with a $1,500 Neighborhood Purposes Grant. The students had a great time and we received their creative thank you notes and drawings displaying what they learned at one of our meetings afterward. We invite you to get involved in improving North Hollywood, increasing civic engagement and making government more responsive to our needs. Please join us at one of our meetings which are held on the third Thursday of the month, 6:30pm at Fire Station 89 in the Community Room. The meeting usually starts with refreshments and an opportunity the meet the Board Members and your neighbors.